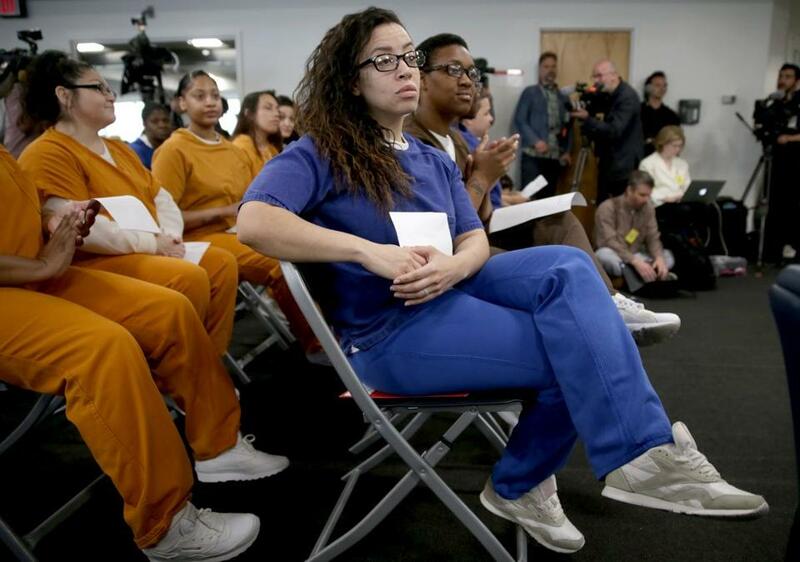 Ashley McSween waited with her question during the candidates forum at the South Bay House of Correction. The forum was billed as historic, the first of its kind in the country. 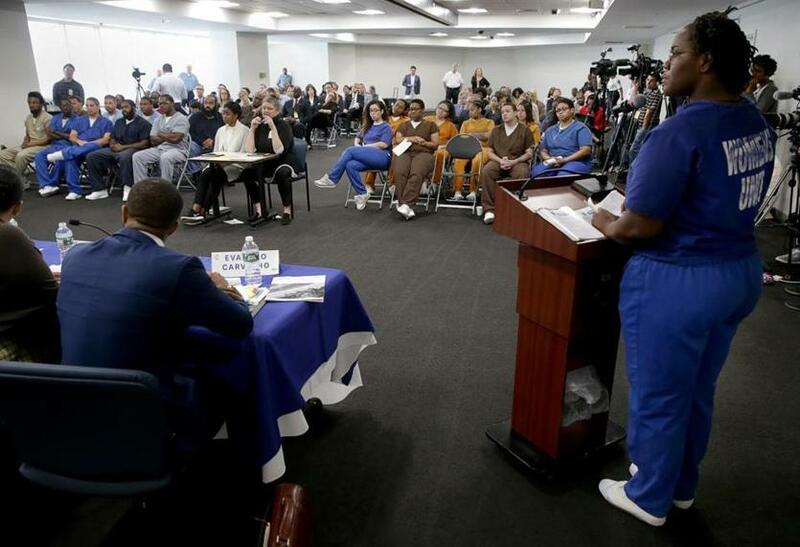 Within jailhouse walls, inmates listened attentively Tuesday as the six candidates vying for Suffolk County district attorney debated issues and campaigned for their vote. 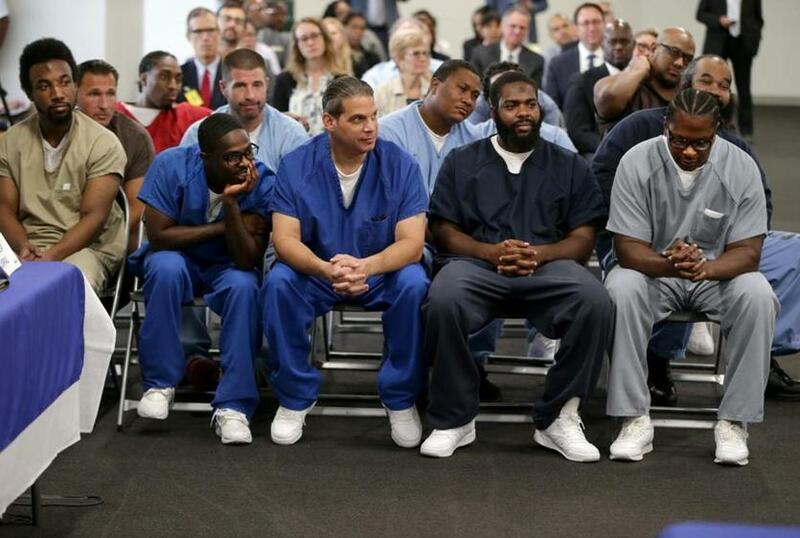 Fourteen men and 11 women, dressed in jail scrubs and sneakers, filled the visiting room of the South Bay House of Correction in Boston, where they asked candidates why defendants are so often pressured into making plea deals, what they can do about court fees many defendants cannot afford, and whether undocumented immigrants should be deported if they are convicted of a nonviolent offense. “If elected, will you hold police accountable for their actions?” asked one inmate, Vincent Weaks. Jail staff read the questions ahead of time, though a jail spokesman stressed that inmates were not discouraged from asking particular questions. Inmates were told not to make any additional statements. They read their questions aloud from a podium next to the table reserved for the candidates: Carvalho, former Suffolk prosecutor Linda Champion, Suffolk Assistant District Attorney Greg Henning, defense attorneys Michael Maloney and Shannon McAuliffe, and Rachael Splaine Rollins, former legal counsel for Massport and the MBTA. 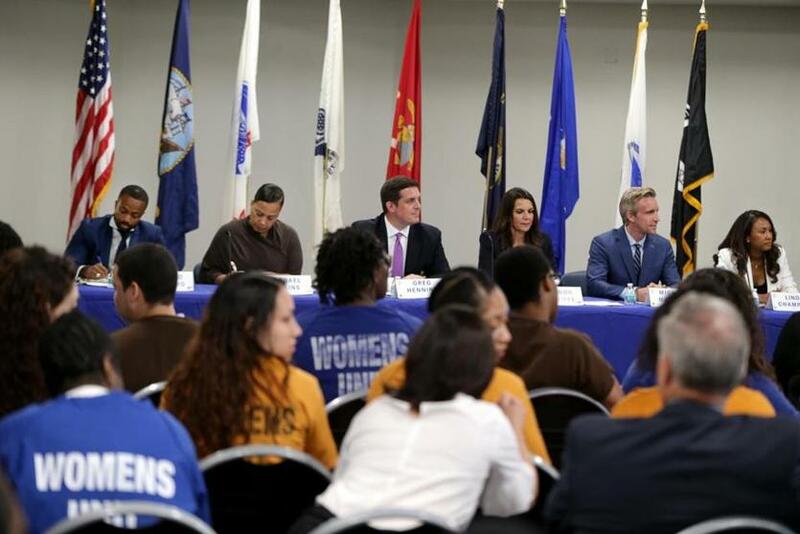 The forum, organized by Suffolk County Sheriff Steven Tompkins and the American Civil Liberties Union of Massachusetts, was hailed as unprecedented, the first time candidates for the position of top prosecutor had visited a house of correction to seek the vote of those who had been prosecuted. The candidates at the forum. In many ways, the event was similar to any campaign forum, whether hosted by the League of Women Voters or a VFW chapter. The candidates touted their credentials as the audience listened politely, and sipped water from Styrofoam cups. But there were also moments that showed how the movement to reform the criminal justice system, an issue that has dominated the campaign, resonated personally for those in the audience. Many questions centered around the opioid epidemic: What could candidates do about the lack of beds for people trying to recover? Would they favor bringing suboxone or methadone into the jails? Should elderly or chronically ill inmates be allowed medical marijuana? In turn, some of the candidates related personal stories to shed light on their positions. Rollins, 47, who said she favored medical marijuana in the jails and alternative medications for inmates recovering from opioid addiction, told the inmates she had learned just that morning that her first cousin had been found dead of an overdose. Champion, 44, talked about the challenges of being a homeless teenager in Boston and the daughter of a South Korean mother who fled her abusive father. Carvalho, 36, described how he was arrested as a teenager in Boston — for riding in a stolen car, he has said — and lost a close friend to murder. McAuliffe, 49, told the inmates that as a longtime defense attorney in Boston she knew first-hand the flaws of the prosecutor’s office. Tyquannya G. Tyson volunteered to read a question at the event. While the candidates were eager to showcase their progressive views, some emphasized the limits on prosecutorial discretion. Henning, a 38-year-old career prosecutor who left the office for a year to teach in the Boston public schools, pledged that as district attorney he would instruct prosecutors to seek bail only in cases where they would seek jail time. He said he sympathized with defendants who struggle to pay court fees, but noted that many of those fees pay for the restitution of victims. “There are victim witness fees and those funds go toward often forgotten people,” he said. Maloney, 37, who is running as an independent, said defense attorneys are largely responsible for making sure immigrants know they may be deported if they plead guilty to an offense. The inmates will have a chance to vote in the Sept. 4 Democratic primary; those being detained for misdemeanors can file an absentee ballot. No Republicans are running. From left: Patrick Brown, Michael Brown, Scott Stillman, Vincent Weaks, and Guy Waters.